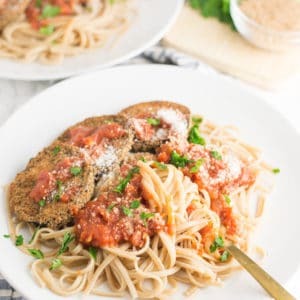 This eggplant parmesan recipe is as easy as they get! Only 5 ingredients are required to make this egg and dairy-free baked eggplant. Pair with some pasta and try this recipe for a healthy weeknight meal! On one plate, add flour. On another plate, mix together breadcrumbs and Italian seasoning. Pour almond milk into a bowl. Take an eggplant slice and dip in flour on both sides, then dunk in almond milk, then coat with breadcrumbs. Place on baking sheet lined with parchment paper. Do this to all the eggplant slices. Bake for 20 minutes. Flip and bake for an additional 2-3 minutes.